Testimonials - Gilmore N Jaz - A Perfect Act for any Occasion! Feb 2018 Bardolino Swindon -MPW Restaurants – “Thank You you guys make all the difference” Marco Pierre White. Feb 2018 MECA Swindon – Erica & Andys 5th Wedding Aniversary / TAO production – Hi Guys, as ever you were brilliant and made a great night better for Erica & myself; Thanks so much to two very talented friends x. Andy & Erica Cotton. Swindon Advertiser 27th Jan 18 – It was a foggy Wednesday in January when we headed to the restaurant, formerly The Old Bank Brasserie but smartened up and rebranded last summer as Bardolino. There were a few people drinking in the bar but we were the only diners at 8pm, which could have made for a flat atmosphere if not for the fantastic jazz duo giving it their all at the front of the house… nice. The Whatley Manor Hotel & Spa – You can see the impact you made thank you. Sue Williams GM at Relais & Chateaux icon Whatley Manor. The Whatley Manor Hotel & Spa – Opening of the refurbished Greys Restaurant. Loved the sound from this duo tonight. Thank you for helping us set the scene tonight. Nov 2017. Jo.Holmes Event Manager. 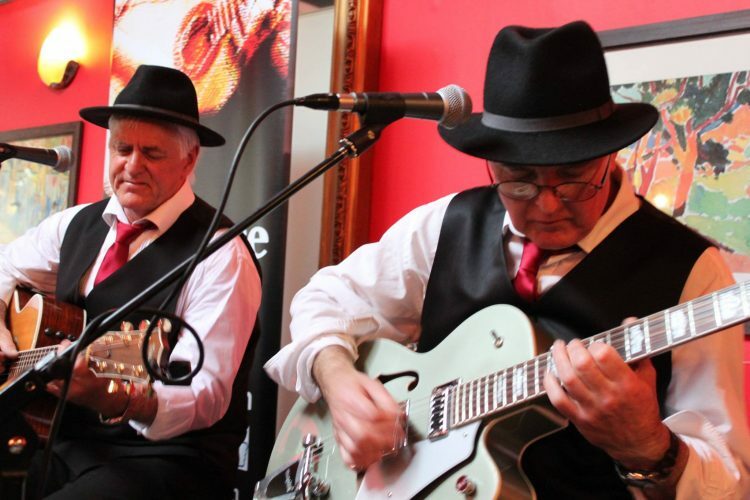 The Weighbridge Brewhouse Trip Advisor – There’s often live music there. I’m not normally a fan of music in restaurants; I like a conversation at social meals and usually, music is too loud and gets in the way. And often it’s not that good. Here, it’s good, and not too intrusive. Local music duo Gilmore ‘n’ Jaz perform at Bardolino in Wood Street, Old Town Swindon on Wednesday the 26th July from 7:30pm to 10:00pm. Today, the duo, Gilmore ‘n’ Jaz are well known and respected on the jazz and music festival scene, but, it nearly didn’t happen at all. Six years ago, Swindon born musicians Stevie Gilmore and Stevie Jaz were playing in a latin sextet together. As an aside, they took a last minute gig in what was then ‘The Old Bank’ restaurant and cocktails bar in Wood Street, Swindon. The two Stevie’s did the show unprepared, unrehearsed and, as per jazz tradition, with no set list whatsoever…’to see where it would go’. It shouldn’t have done, but it worked. It worked very well indeed. People started to wander in off the street to hear the lively guitar music and in no time they were regularly packing the place out. Not long afterwards, the sextet disbanded and Gimore n’ Jaz was formed. They became the main featured act in 18 Wood Street for a very long while. Thinking back on those times Stevie Gilmore said, “I dread to think what we were like back then but we always enjoyed ourselves. I think that’s one of the things people liked about us. We always put the audience and the venue first and I think folks just liked seeing us having great fun playing our music. It was hard work but we kept at it and soon found ourselves live on Sue Davis’s BBC radio show which was quickly followed by a live performance at the Trout Inn jazz venue near Lechlade. Three years in and we were regularly performing at some big corporate events before hitting the scene proper at the Marlborough International Jazz Festival. We went down a storm and that was it, we were up and running. Highlights have included a big music industry event where we were booked to perform live in front of Mumford and Son, The Hollies and the Commitments. At one point Adele and Lemar were watching us in New York via an agent’s phone. Sharing the bill and the green room with Status Quo at the Lechlade Festival was fun. And it has been an honour to perform at the Cheltenham Jazz Festival for the last two years. But to be honest we don’t need the big names to enjoy playing. Some of the sweetest venues have been to play at weddings or anniversary celebrations– it is very rewarding to be part of someone’s special day. Now, six successful, very busy years on, Gilmore ‘n’ Jaz return to number 18 Wood Street Swindon, to perform live in the very same spot where it all began, only this time it’s called Bardolino and famous for its delicious Italian cuisine under the direction of top chef Marco Pierre White. There is much I admire about the Asian way of life. By respecting wisdom and not youth, they are able to tap in to the experience of those who have been doing something well for a long time. I was reminded of this when I saw GILMORE ‘n’ JAZ at the Crown in Stratton St Margaret last week. Despite the two members having spent more time making great music than (say) the combined members of JLS have spent being alive, it IS experience that counts. And no-one did any backflips. The two guitarists and singers came up with an amazing range of songs: there were blues standards like Stormy Monday, classic jazz songs such as Take Five, original rock ‘n’ roll like Johnny B. Goode (performed brilliantly), some country, some originals and all sorts. Other bands might have been tempted to change too much when going from style to style. Maybe bring in a harmonica for the blues stuff, a steel guitar for the country songs. In the case of Gilmore and Jaz, the instrumental simplicity of the arrangements is what gives the set cohesion. Because songs are all structured around one lead and one rhythm acoustic guitar, with up to two vocal parts, songs flow naturally from one genre to the next. And there have been deliberate, surprising but very successful attempts to make this work. Songs like Last Train to Clarksville were slowed down and completely rediscovered when played in this format. The Monkees’ original backing vocals work very well as a lead guitar riff. It is the notes that matter. The shape of them needs only to be consistent with the arrangement, and it was. Less is more. It doesn’t matter how fancy the sauce is as long as the meat is good, and this tasted like home. It is so nice to see proper music with proper musicians again. There has been something of a renaissance for the acoustic guitar in recent years, with people like James Blunt, Newton Faulkner and Damien Rice bringing it back to the charts. From its original role as a troubadour’s accompaniment, to being as much a symbol of the 60s revolution as the CND sign or Che Guevara poster, the humble acoustic has come a long way. And Gilmore and Jaz are continuing this journey. Like the blues and jazz greats of history, like country legend Willie Nelson, who said nobody can write a song in an hour, because it’s their life up to that point that makes it possible, there is no substitute for experience. Gilmore ‘n’ Jaz are two more musical travellers, journeymen on the long road from apprentice to master. And they stopped being apprentices a very long time ago. I am not sure whether to be cheered that it is possible to see music of this quality for free in a pub in Swindon or depressed for exactly the same reason. I actually felt guilty to be so entertained for free.